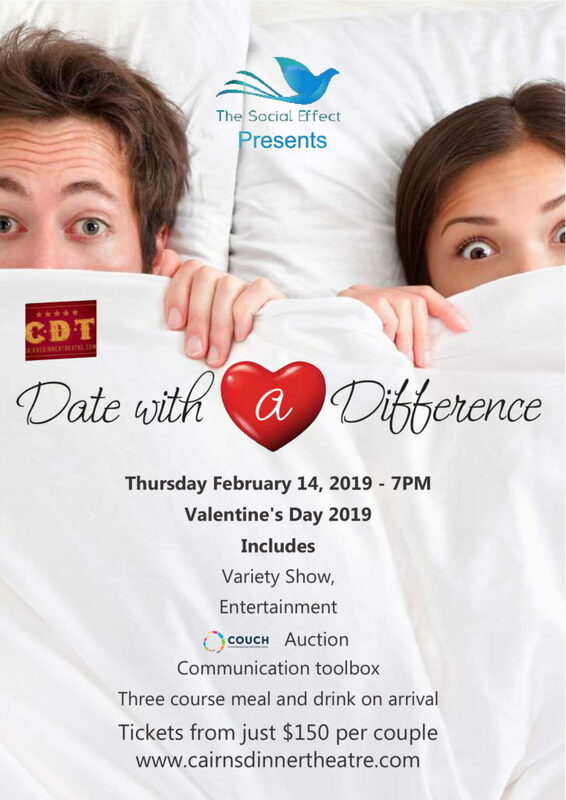 Date With a Difference is brought to you by The Social Effect and Cairns Dinner Theatre. We are bringing to you a variety show for couples to make 2019’s Valentines day one that you will remember. The evening will feature comedy, dancing, singing and a taste of how to really communicate on a deeper level with your other half. A short part of the night will be an auction with a difference, one that will have you laughing along the way while raising funds for COUCH. All items will be for couples, anything from a trip in a helicopter, a meal for two, massages and much more! All this while enjoying a 3 course meal and a drink on arrival.